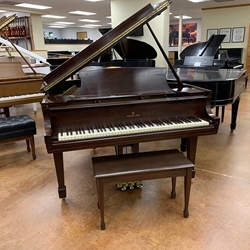 This beautiful 1965 Steinway and Sons Louis XV M Grand is a wonderful piano! It has recently been serviced by our expert technician and will receive a full tuning before it is delivered. At 5 foot 7 inches, this grand is the perfect size for most rooms and will sound great in any environment. In excellent condition with a few light scratches on the cabinet. The cabinet looks to be cherry wood with a walnut stain.